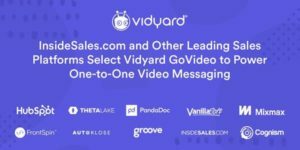 Vidyard, the leading video platform for business, announced that InsideSales.com and other leading providers of sales engagement and sales prospecting solutions have integrated Vidyard GoVideo to power one-to-one video messaging within their platforms. “By further extending the reach of Vidyard GoVideo to help sales professionals, we’re making it incredibly simple for any sales rep or solutions engineer to create personal video messages, access existing video content, and build custom playlists for customers and prospects, then share and track video viewing data within existing business applications,” says Michael Litt, CEO and Co-founder of Vidyard. 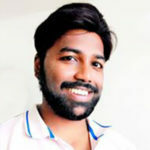 Known for ease of use in quickly capturing, sharing, hosting and tracking personalized videos, Vidyard GoVideo, Vidyards’s flagship video messaging app, helps sales professionals develop more pipeline by incorporating customized one-to-one video messages into every step of the customer journey. These feature integrations and applications join Vidyard’s flourishing Integrations Directory, a collection of more than 30 marketing and sales solutions that bring the power of video to a broad spectrum of platforms helping sales, marketing, and customer experience professionals humanize business communications with video. Autoklose: Sales professionals can automate their way through the sales process, closing more deals faster by sending video communication to their top targets. Cognism: Help sales teams reach over 400M business professionals with custom personas, campaigns, sales sequences, and personal video messaging with Prospector. FrontSpin: Enable sales reps to connect with 3x more leads, streamline workflow with account-based playbooks, and increase engagement with personalized video emails. Groove: Help sales teams improve efficiency, get actionable insights, and drive revenue with personal video messaging in every stage of the sales cycle. HubSpot: Create powerful connections at all stages of the customer journey with HubSpot Video – from generating leads to closing deals to delighting customers. InsideSales.com: Accelerate sales and business growth with the only full-stack AI Sales platform powered by Collective Intelligence™ insights into billions of global B2B buyer interactions. The InsideSales.com platform includes the most accurate and compelling Email Prospecting module that makes creating, targeting, and tracking multi-recipient emails with video and attachments as easy and compelling as SnapChat and Instagram. Mixmax: Send out sales emails that actually get replies! Increase conversions with templates, sequences, and personal video for outbound communications. PandaDoc: Create, send, track, and e-Sign client-facing documents now enhanced with video communication designed to win more business. Theta Lake: Enhance video ROIs by streamlining compliance review process through automated risk detection, AI-assisted workflow, and compliant archiving. VanillaSoft: Helping sales teams qualify and close more deals with VanillaSoft’s Sales Engagement platform and personal Video messaging. “There’s a growing chasm between buyer expectations and traditional email outreach. Conditioned by social media apps like Instagram, modern buyers want timely, informed, and personalized experiences,” says Gabe Larsen, Vice President of Growth for InsideSales.com. Research shows that using video content has a significant positive impact on both open and reply rates. Teams that use video enjoy a 16% bump in open rates and a remarkable 26% increase in replies. Data scientists concluded that a well-placed and timed video in a sales outreach is an undisputed value-add to sales cadences. Moreover, emails containing a video sent within the 2nd and 20th day of a cadence result in significantly higher reply rates. With millions of videos created by nearly 500,000 users, Vidyard GoVideo helps power sales conversations because it takes care of the heavy lifting, including video capture, cloud-based video hosting, and encoding, video playback on dedicated pages, video engagement tracking and video view notifications. One-to-one videos are also showing higher levels of engagement than more polished video content because it’s seen as authentic and therefore more trustworthy. 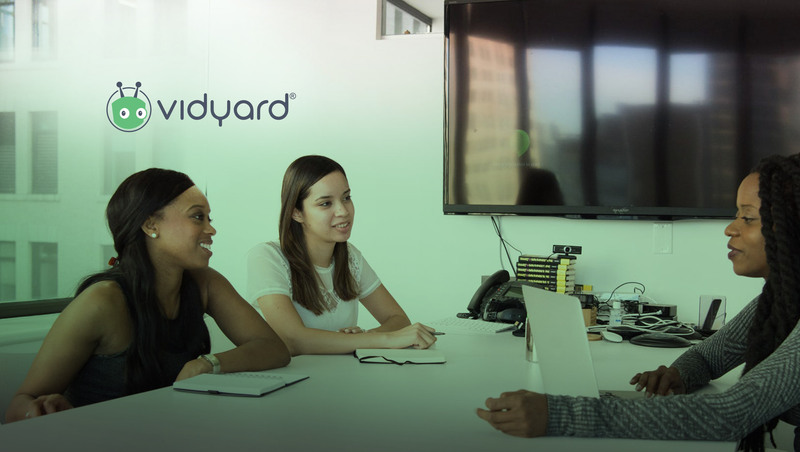 The latest partnership announcement comes one year after Vidyard expanded its Integration Directory partner ecosystem with the introduction of its Vidyard GoVideo partner app. With more than 30 partner integrations and applications, including HubSpot Video, a fully integrated video solution made available to HubSpot customers, Vidyard’s Integration Directory partners rely on Vidyard to power integrated experiences for video hosting, video analytics, and personalized video messaging. Vidyard is committed to helping business professionals access, create, share and track their videos from within the applications they rely on every day.